Super Eagles arrived home on Tuesday after winning the country’s first Africa Cup of Nations trophy in nearly two decades and were welcomed by adoring crowds as well as millions of dollars in rewards. Nigerian President Goodluck Jonathan announced at a reception for the team late on Tuesday that coach Stephen Keshi would receive $64 000 from the government, while the players would receive half of that plus a plot of land in the capital. Jonathan also listed another $4.2 million pledged by prominent Nigerians for the team and staff. “You are our super heroes. You have put a spring in our steps,” the president said after posing for pictures with the team and the championship trophy. The lavish rewards immediately stoked criticism among some Nigerians on Twitter who questioned whether they were appropriate in a country that is Africa’s biggest oil producer but which struggles to provide basic infrastructure. Earlier in the day, hundreds welcomed the team back at the airport in the capital Abuja before a very brief appearance later in the afternoon on the grounds of the National Stadium. Along the road from the airport toward the city, school children dressed in their uniforms waited for the team convoy and waved Nigerian flags. A crowd of several hundred fans received the team on arrival at the national stadium in a bus draped in the same colours. Keshi and his team were given a loud cheer when they emerged from the bus and supporters surged forward to greet them. But the appearance lasted no more than 10 minutes. The players, their coach and other officials shook a few hands of their fans and stepped back on board the bus to head to their hotel before meeting Jonathan later. The Nations Cup victory in South Africa has thrilled Nigeria, Africa’s most populous nation but where the team has in recent years failed to play up to its potential. A 1-0 win over Burkina Faso, thanks to a winner from locally based player Sunday Mba, gave the football mad nation its first African championship since 1994. Celebrations however were initially tainted by the announcement that coach Keshi was resigning. The Nigerian Football Federation later released a statement said to be signed by him and saying he was changing his mind after the sports minister intervened. 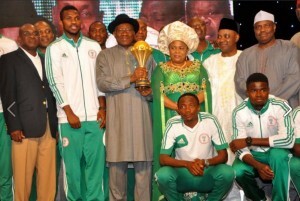 At Tuesday night’s event, Keshi posed for pictures alongside the president and was cheered. With the victory, he became one of only two men to win the African Cup of Nations as both a player and a coach.